If you are looking for a genuine Parisian bistro with a great atmosphere this is the ‘Ruby’ you have to join. This wine bistro is named in reference to the color of the gamay grape used to make the wines of Beaujolais.This old bistro has not changed in the past 50 years. It continues to whole heartedly promote the Beaujolais wines and the bistrot spirit. The casks are still outside the entrance door, with aperitifs placed atop their glass tops to enjoy with friends. 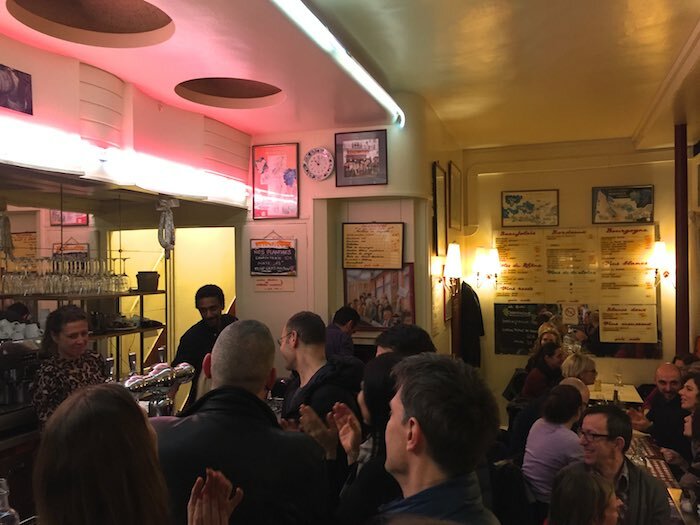 The Rubis is a perfect example of the tradition of true Parisian bistros. This is especially obvious in this 1st district area of Paris, around the Saint-Honoré market where many restaurants are soul less. It is at the Rubis that one comes to meet others who also come for the pleasure of good company and the jovial atmosphere. If you are lucky, the boss will fill your glass with a little delicious white wine that you will savour together with a plate of ham and sausage while chatting with your neighbors. Year after year, the bistro always rates with great success. At lunch, the place is full of people. 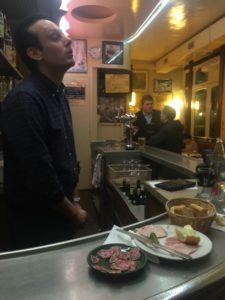 Not surprising as Le Rubis bistro is one of the best priced restaurants for quality in the neighborhood with, for example, the charcuterie plate, priced at 10 €. Behind its bar counter, Jean-Philippe will make you discover some unknown white and red wines full of finesse and subtlety. 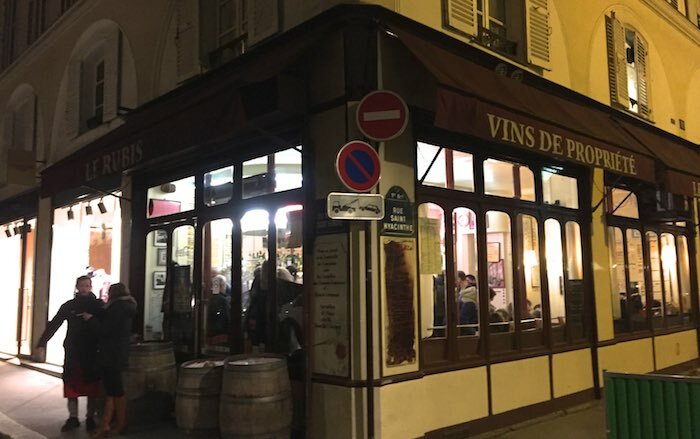 Le Rubis is one of the last cafés of the french capital to bottle its wines. 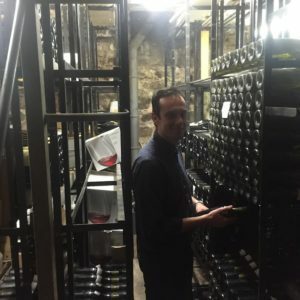 The boss receives its wines from Beaujolais and it is he who fill the bottles in the cellar. Le Rubis offers some very good examples of traditional bistro dishes. For starters, leeks vinaigrette (6€) or French snails but bio (8 € 6). Of course, one could choose an egg mayonnaise (5.5 €) or taste an endive salad with bleu d’Auvergne cheese (blue cheese). Not to mention the foie gras « maison » (15 € ). For those who love beef, there is of course a nice steak (22 €) or tartar steak (14.5 €). 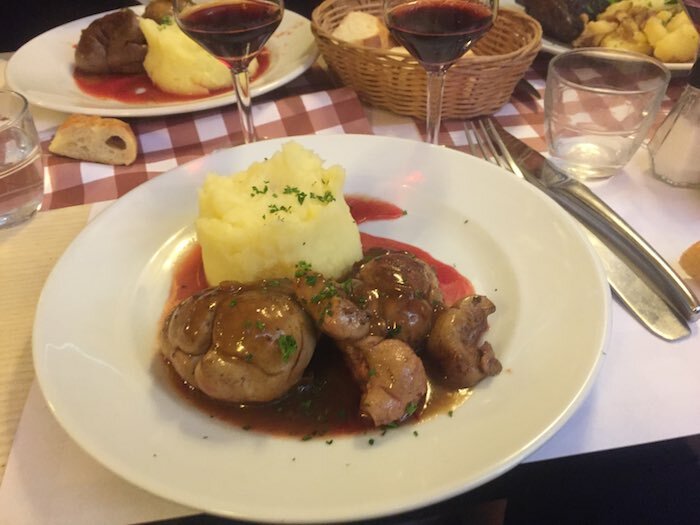 There are also real Parisian bistro specialties such as the excellent veal kidneys with a porto sauce (18 €), a true bistro dish to discover. Don’t forget to taste the Auvergne cheeses prior to culminating with a traditional Tarte Tatin.